The Eccotemp EZ-FLUSH System Descaler Kit is the answer to any water scale, lime, or rust deposit buildup in virtually any piece of water based equipment. The EZ-FLUSH system has been designed to work seamlessly with Tankless Water Heaters and is compact for easy use and storage. It includes our Eccotemp Descaler that is specifically made to dissolve the toughest build up and is a non-toxic concentrate which is certified to NSF/ANSI 60 for use as a cleaner in potable water systems. The EZ-FLUSH System Descaler kit includes a built in 350 GPH pump, 2 five ft. rubber hoses, and 1 QT. of Eccotemp Descaler. Keep your tankless water heater running at full efficiency and ensure it provides hot water for years to come with the Eccotemp EZ -FLUSH System Descaler Kit. 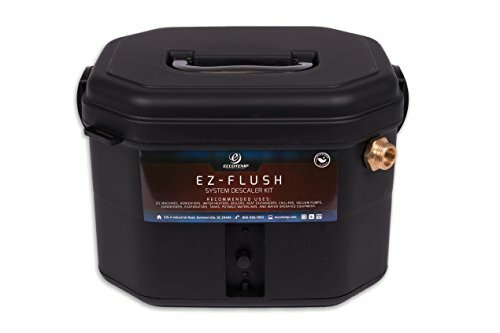 EZ-FLUSH System Descaler Kit Features: 110 volt UL listed power cord Standard 3/4 inch connections ON & OFF Switch Compact Design Certified NSF/ANSI 60 Non-Corrosive Non-Toxic Biodegradable. If you have any questions about this product by Eccotemp Systems, contact us by completing and submitting the form below. If you are looking for a specif part number, please include it with your message.